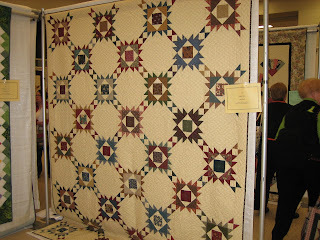 This morning I was able to make a trip to the 2007 Quilt Guild of Indianapolis Quilt Show. There were about 600 quilts on display and 16 vendors, so it wasn't too big of an event, but it was still filled with lots of inspiration. I particularly seemed to notice the different settings and border ideas on many of the quilts this year. I haven't been noticeably creative in regards to those two aspects of my quilt designs, so 2008 will have to be my year to play around with some new ideas! 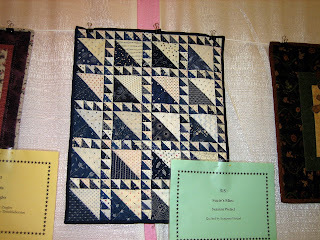 This was one of several miniature quilts I was enamored with. I love two color quilts, especially navy and white. and the more complex scrappiness of the union star blocks. 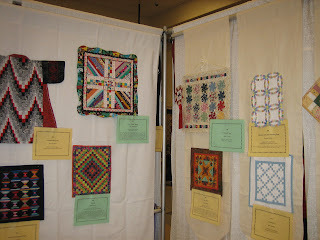 Several of the miniature quilts hanging together. The one with the 2nd place ribbon was quite unique, but I liked it! 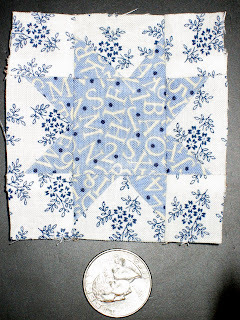 The tiny double wedding ring quilt (shown upper right) has little 1/2 inch pieces in the rings. The note from the maker said the quilt took her as long as a full size double wedding ring would have! 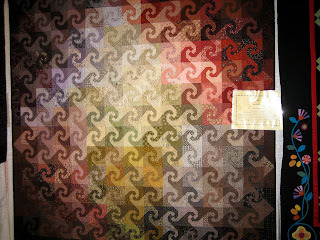 This tessellating snail's trail quilt was done as a color study. The picture really doesn't do the quilt justice. It was beautiful. A full size double wedding ring quilt, titled, "My One and Only Double Wedding Ring". 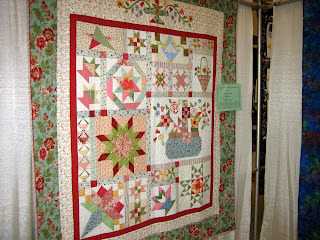 It was beautiful, and won the first place ribbon in the pieced wall quilt category. 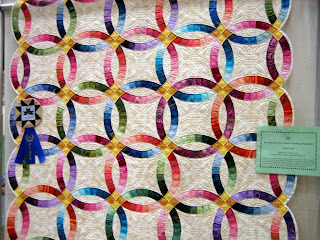 I love how the quilter used gradated hand-dyed fabrics in the rings. This type of quilt wouldn't usually be my style, but something about it appealed to me... probably the freshness of the colors, and the girliness of it. Wouldn't it look cute on the wall of little girl's bedroom? I also coveted a beautiful antique doll my neighbor received for Christmas one year. It had been her mother's doll when she was little, and had a painted wooden head, chipped in a few spots, which added to its charm. When I was in college, I spent the summers working at a specialty toy shop in my hometown. I loved being in charge of the window displays, and the shelf display behind the cash register. Among its many classic and wonderful toys and books, were 20 or more different types of Madam Alexander dolls. I always dreamt of getting the lot of them and displying them in my room, but at $65 each, even just one was out of my college-student budget. 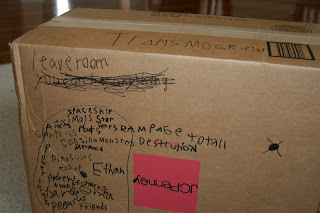 The other thing I think would be fun to collect is doll houses. Wouldn't it be great to have a whole neighborhood... Each house could be decorated in a different style. 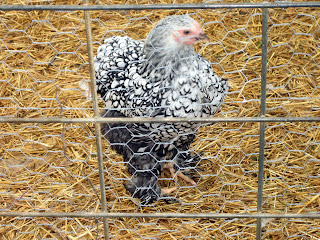 Turkey Feathers is one of my favorite blogs. 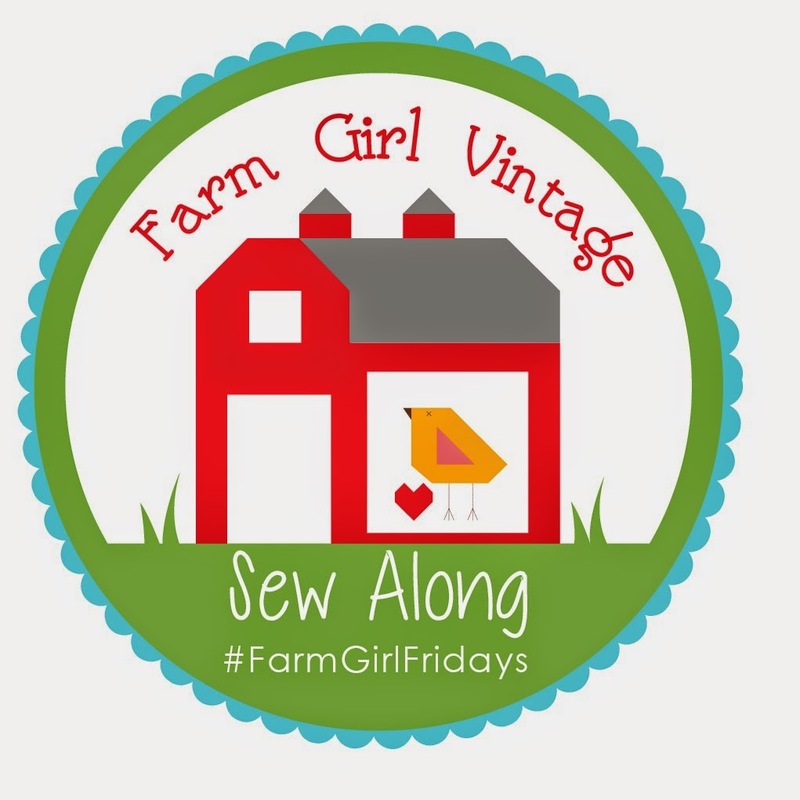 Her daughter makes and sells doll house baked goods on their Etsy site. The cutest things you can imagine! She has great eye candy on her blog, but the miniatures are what keep me coming back! I meant to post this photo the day after my pregnancy shot, but life got in the way. 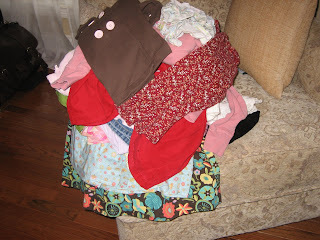 Here is the cute little bundle that made me look like I had a huge bouncy ball stuck in my shirt! 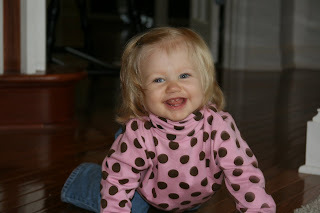 She is such a fun baby... we are so grateful to have her in our family! Sophie (1 day old) freshly home from the hospital! I've mentioned before how much I love Chicago. It is a beautiful city with lots of fun things to entertain the whole family. On Friday, we celebrated Sophie's birthday with a trip to the Shedd Aquarium, and a ride to the (almost) top of the Sears Tower. All 4 of the kiddos had fun looking around the city, recognizing various landmarks we have visited over the past few years. Here are a couple pictures of the amazing views. The pictures really don't do the city justice! On Saturday, we got to meet Lyle for lunch. He was in Chicago for the weekend taking part in a Moot Court Trial competition. They don't call it the Windy City for nothing... it was really windy! But luckily it wasn't too cold. He and his law partner were off to the Art Institute of Chicago after lunch, and we decided it sounded like fun, so we got in line behind them. Andrew is modeling a "bracelet" he made in the kids craft center. Elliott had a lot of fun explaining various styles to the kids, including this cubist work. Ethan was very interested in his Dad's explanations. We bought a museum guidebook, which Ethan looked at quite a bit today also. Andrew liked to go around and read the descriptions of all the paintings. Ethan was also desperate to visit the African art section of the Museum. 1-He really love his aunt Joojie, and 2-He really likes how animals are depicted in African sculptures. He wasn't disappointed, as evidenced by all the photos he made Elliott take in that section. Last Tuesday I was able to accompany Emma's class to a local pumpkin patch. 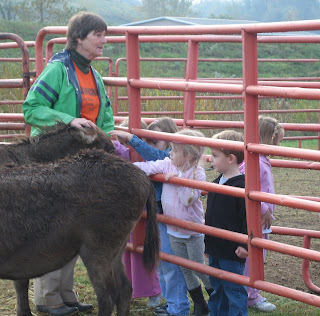 We had fun petting and feeding various animals, finding our way through the corn maze, taking a hay ride, and choosing a pumpkin in the pumpkin patch. 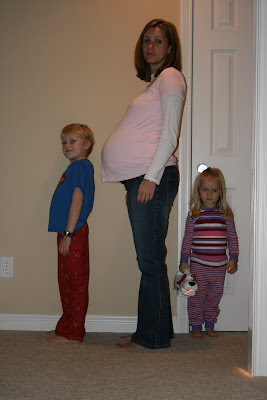 ...this is what our tummies looked like! 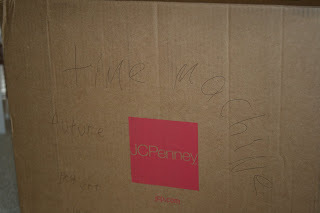 Yesterday, FedEx delivered a fun package from our Texas cousins... So much cute stuff! 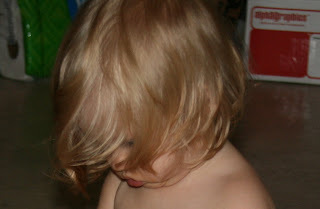 Emma already wore the brown dress with the blue and coral flowers (see it on the bottom?) There were lots of cute jackets, skirts, dresses, sweaters, and even a couple of pairs of shoes. Thanks Leslie! 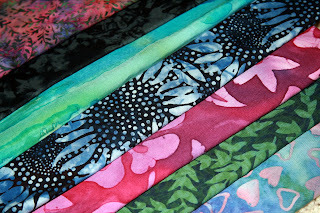 Portabellopixie (Sandi) has been designing some yummy fabrics... you can see them here. I can't wait for them to hit the stores... Love that pink colorway. How fun to be able to take a design from a drawing to fabric! Have you been to Segullah yet? Always some very inspiring articles. Grab a cup of hot cocoa (or lemonade, Leslie!) and have a good read. 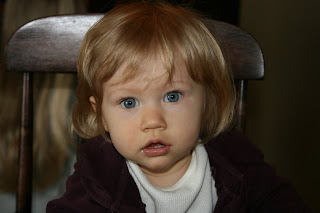 I am sorry to anyone I have offended, both in blog comments, blog posts, and in person. I try not to be rude, and to think before I speak, and I promise I am better than I used to be, but I know I fall short of the level of kindness I should be at. Please know that I have not meant to offend, and I sincerely apologize if you have been offended by my opinions and comments. I have been designing and redesigning the quilt I am making in the doll quilt swap. which are more in keeping with the style of the quilter I am making a quilt for. See how it is starting to be unwrapped? She did that all by herself! I am slowly working my way backwards through English history. I am about to start learning more about the Wars of the Roses, the Houses of Lancaster and York, and the Princes in the Tower. Exciting stuff! I love that many books can be found on Amazon for practically nothing. Including shipping, I didn't pay more than $5 for any of these books! The fabric will become a nice easy bar quilt. I have almost finished the current wild quilt top I am working on. Just waiting for a little yardage to arrive for another border I decided the quilt needed. That one will be the first I try machine quilting on my own. You will remember that Elliott bought me an amazing sewing machine for my birthday a couple of years ago. It is a dream machine, and I am SO happy to have it with all the quilting I am doing lately. These books, combined with the doll quilt swap and this new fabric should keep me busy until after Thanksgiving. Whoopee!